Next morning is for departures. 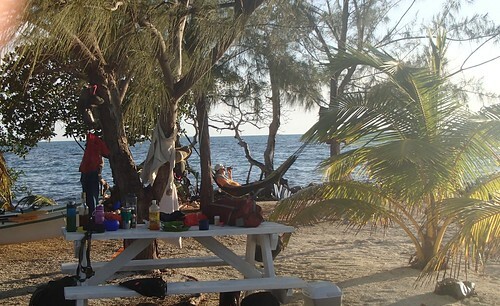 As we cook coffee and oatmeal at our campsite, Ismael the volleyball coach, guide, drummer and singer is solemnly raking the sand of the whole island compound. He’s transformed the ceremonial space of last night’s fire and chanting to a clean white carpet. I ask him about the chants and he tells me that Garifuna compose songs for everything, fishing, cooking, loss of love, sadness—all come from the soul. We will be taken by motor boat back to Dangriga to retrieve our stashed belongings and stand together for the last time. From there Joe and I will go to the interior to spend two nights at Mommaloots, an ecoresort in the jungle where we encounter more fascinating people and memorable sights. 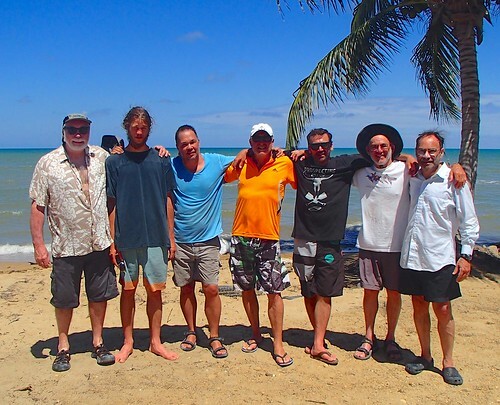 Peter, John, Lionel, Andy and Eban will remain in Belize for several more days, enjoying new adventures. On the flight back to Houston I have a short conversation with a young man hardly 30 sitting next to me who’s just downed two little bottles of vodka purchased from the attendant. He’s returning from a five-day trip during which he bought a lot near the beach in a resort subdivision outside of Belize City for $230,000 USD. It’s an investment for his retirement, secure, he says, because of the way the place is growing. “Maybe,” I say, “though with the way sea level is rising, you never know.” As we fly over the Yucatan coast near Cancun, I ask where he’s from. “Saskatchewan,” he replies, “but right now I’m headed back to work in northern Alberta.” “Tar sands?” I inquire. “Yep” is the answer. I shut down the stove and hustle to do his bidding. 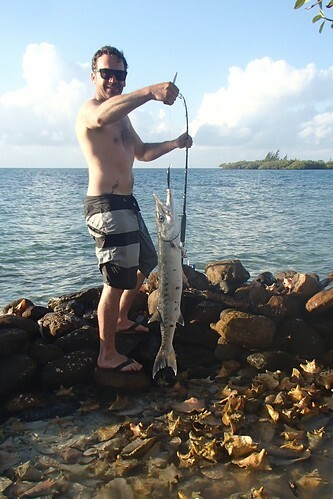 His pole is bowed and then a big shining barracuda appears on the end of the line. 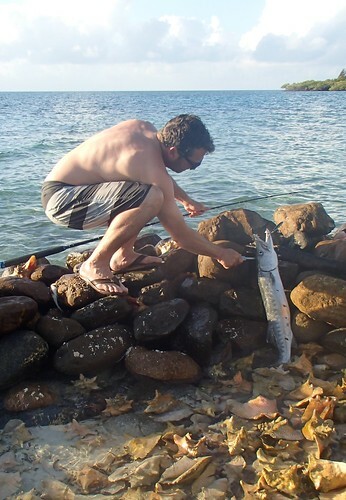 He lifts it onto the rocks, carefully grabs its sharp-toothed mouth with his special fish pliers and removes the hook. The creature thrashes wildly and Joe asks for a club. I cant find one, so he stabs it repeatedly in the head with his fish knife. By now the whole gang is watching and cheering. 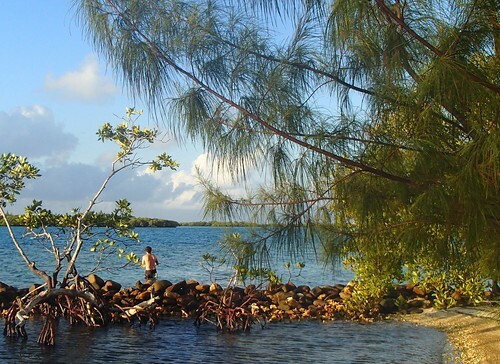 When the desperate gasping in the gills ceases, he carries it across the island to Fidel’s dock for cleaning. 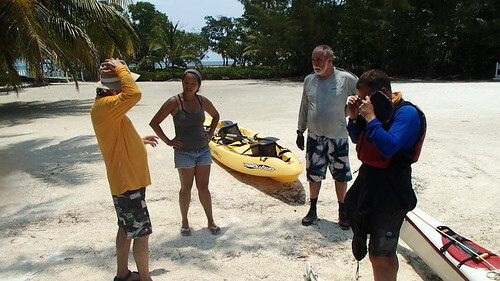 We strike camp and pack the kayaks, reluctant to leave the luxury of Cocoplum, but eager to experience what comes next. 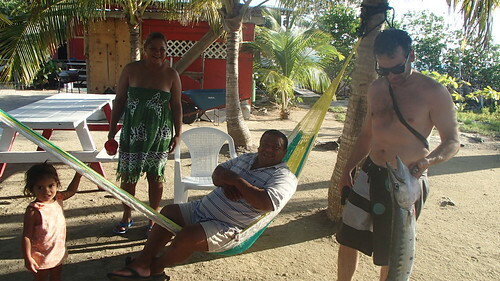 The manager shows up to see us off, friendly but vigilant, and discloses that the original owner of the island was a drug dealer. The adjoining island to the south is another luxury resort, one less ecologically friendly, built with steel and concrete. During the crossing of a wide expanse of water, Eman, who has adopted the solo kayak, confounds his elders by paddling only with his hands. 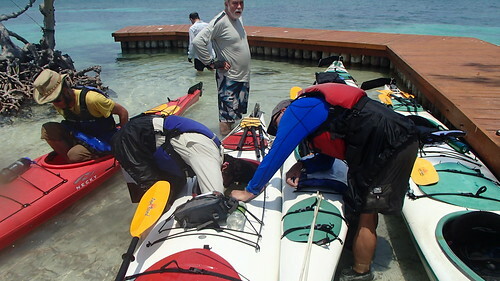 Joe discovers that the rudder on our boat isn’t working and we pull in at the first dock on the next Caye to see about repairing it. A young Asian woman approaches and anxiously says that we cant stop here because a guest party is about to arrive. They are paying $3000 per night and want the place for themselves. Joe says we’ll be out well before her noon deadline, and she relaxes a little. She’s from San Diego, and seems just like a Cal Poly student. He finishes the repair, knotting some rope to replace the broken section of cable.